Senior Arun Sharma may be studying biology, chemistry, and genome sciences and policy at Duke, but don’t expect to see him trading in his lab coat for a white coat anytime soon. Sharma says he is ‘pre-research’ rather than ‘pre-med’. His interest in research was piqued by his father, a physicist. Growing up in that lab-coat environment showed Sharma that he could one day make his own discoveries. After coming to Duke, Sharma realized he could start on this path early and immersed himself into research as a first-semester freshman. “I thought it was cool that as just an undergraduate, an eighteen year-old, I was able to make new discoveries and participate in long-term research projects,” Sharma says. Through the Howard Hughes Research Fellows Program, Sharma was matched up with his current mentor, Dr. Gerard Blobe in the Department of Pharmacology and Cancer Biology, where he has been investigating the molecular mechanisms behind angiogenesis, or blood vessel formation, in tumors. The concept behind his research is simple: if you can cut off the blood supply to the tumor, you can essentially kill the tumor. Specifically, Sharma’s work revolves around the endoglin protein, a cell surface receptor in endothelial cells, which line the interior of blood vessels. Endoglin has a unique interaction with two other proteins (SMAD2 and BMP), which had not been previously characterized. When a specific member of the Bone Morphogenetic Protein (BMP) family binds to endoglin, SMAD2 is involved in a signaling cascade: SMAD2 is driven to the nucleus, where it prevents cell proliferation, or cell growth, and thus prevents angiogenesis. The long-term application of Sharma’s research would be drug discovery to initiate this signaling cascade and prevent angiogenesis, subsequently killing the tumor by cutting off blood supply. 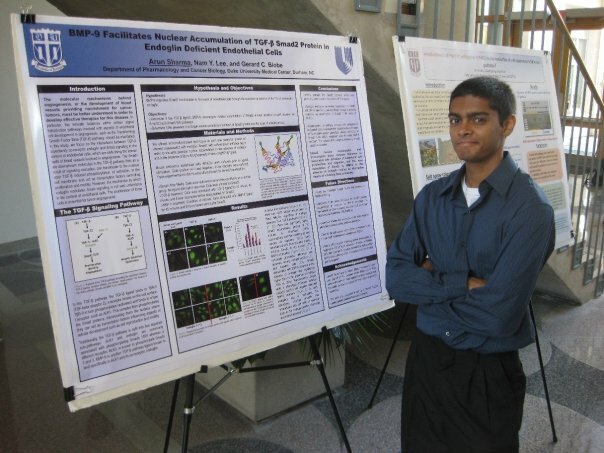 Sharma wanted to share his passion for research with other undergraduates so he co-founded the Duke Undergraduate Research Society (DURS) along with classmates Peter Dong, Nick Schwartz, and Vivek Subramanian to show students that research is a realistic goal and that it is highly accessible to undergraduates. “People think that in research you have to have a lot of training, a lot of background to get anything done productively,” Sharma says. To encourage students to experiment with research (no pun intended! ), DURS hosts renowned faculty speakers such as Dean Nancy Andrews from the School of Medicine and Steve Nowicki at lunch and dinner events. DURS– along with the Undergraduate Research Support Office – has also established Visible Thinking, an undergraduate research symposium – the largest of its kind – that gives students the opportunity to discuss their research with peers and faculty members during a poster session. “I like to think that [this organization] is going to be my legacy at Duke after I graduate,” says Sharma. After graduation, Sharma plans to attend graduate school to explore cardiovascular disease development and to eventually become a principal investigator (PI), leading his own lab. “One thing I’m definitely going to do as a PI is something my own PI, Dr. Blobe, did: provide undergraduates with the opportunity to work in a lab,” he says.